Hanoi (VNA) – Green development projects in Vietnam are catching attention of foreign investors on account of the Government’s favourable policies on land, taxes and capital as well as a large number of potential customers in the country, said Duong Thanh An, Head of the Policy and Legal Affairs Department under the Vietnam Environment Administration. A survey on Japanese investment trend in Vietnam in 2017 held by the Japan External Trade Organisation (JETRO) in Vietnam revealed that at least 25 Japanese businesses have the intention to invest in improving environment quality in Vietnam, such as in waste water treatment for plants and urban areas. Other businesses said they will design warning software for storms, flash floods and tsunami. The Japanese Government has taken measures to support its enterprises’ investment in this segment in the Southeast Asian nation, including Official Development Assistance and Public Private Partnership policies. Currently, Japanese businesses are making a beeline to study investment opportunities in waste water treatment for for-export processing areas and industrial zones in Dong Nai and Binh Duong provinces and Ho Chi Minh City. Kobelco Eco-Solutions Co., Ltd has recently proposed a clean water treatment project in Dong Nai province after investing in sewage treatment systems in Loteco and Long Duc industrial parks in the locality. Meanwhile, high technology, clean and renewable energies and electrical sectors hold the attention of European businesses. Royal HaskoningDHV from the Netherlands has signed a 9.5 million EUR (11.2 million USD) contract with the Ba Ria-Vung Tau Urban Sewerage and Development Company to implement a comprehensive waste water treatment for Phu My new urban area. The plant, which has designed capacity of 30,000 cubic metres per day, will become operational in December, 2019. Investors from the Republic of Korea and China tend to invest in renewable energies. The JA Solar Vietnam, developed by Chinese investor at 280 million USD, is one of the most noticeable projects. Targeting a green economy, the Vietnamese Government and local authorities are tightening the control of environment quality while domestic environment service is unable to meet local demand, posing huge potential for foreign investors. At the same time, the Government has issued a series of preferential treatment policies in terms of land, capital and tax for investors in environmental protection. Increased awareness about the issue among the public and Vietnam’s commitments during the integration process also provide necessary pressure for the shift of investment flow. 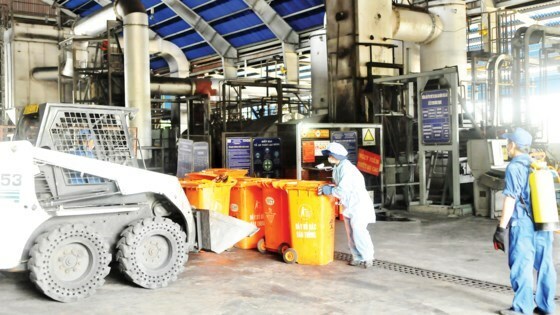 According to the Ministry of Natural Resources and Environment, there were 458 solid waste landfills in Vietnam and over 100 low-capacity waste furnaces which possibly emit hazardous dioxin and furan.